Tuesday May 21st 1901 was busy all morning, got dinner pretty early. Ida and I went to town in the afternoon to do some trading and as the McGovern girls were spending the day up home I stopped there awhile. Wednesday May 22nd 1901 I sewed all day and made Ida a dress skirt she went down town in the afternoon to get some work done on her teeth. Will is through planting corn. Thursday May 23rd 1901 There was a little rain last night and Will hoed the garden before we started to the valley We took Mother with us down to Nelsons and had such a pleasant day of it. It seems good to get down with the valley folks again. Friday May 24th 1901 Will went to town in the forenoon and then went back again in the afternoon he saw Conroy and got ten dollars for keeping his horse that he gave to me. I went calling among the neighbors in the afternoon. 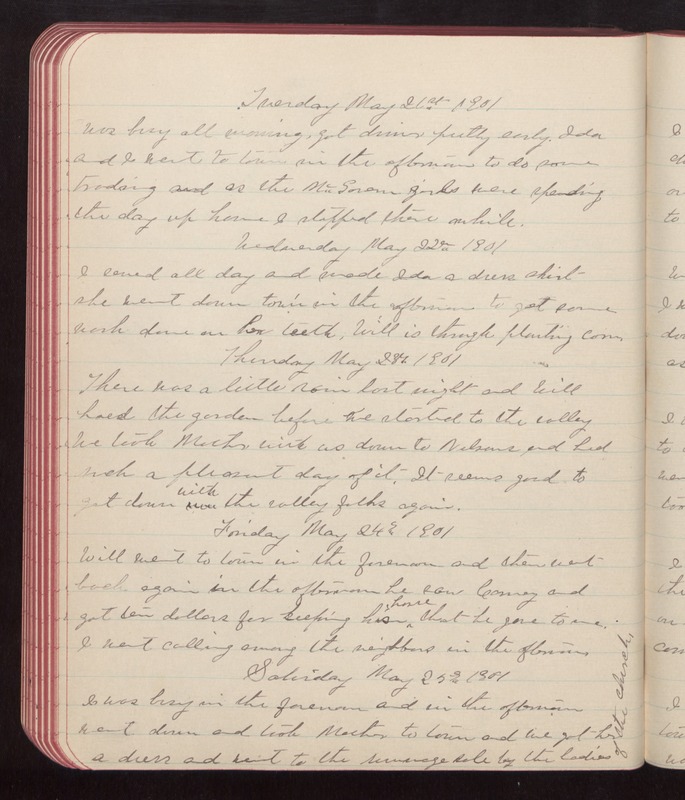 Saturday May 25th 1901 I was busy in the forenoon and in the afternoon went down and took Mother to town and we got her a dress and went to the rummage sale by the ladies of the church.